onsen soaker: Four onsens ranked in "Top 20 Sightseeing Spots in Japan"
Four onsens ranked in "Top 20 Sightseeing Spots in Japan"
Four onsens ranked in "Top 20 sightseeing spots drawing interests from abroad", according to a recent survey conducted by TripAdvisor Japan. The survey is based on their websites' page view, visit length, the number of review posted and etc. by their users outside of Japan. They are Spa World in Osaka (9th), Ooedo Onsen Monogatari (pronounce as Oh-edo) in Tokyo (11th), Spa RaQua in Tokyo (13th), and Takaragawa Onsen in Gunma Pref.(16th). Including Spa World of Osaka, these three places are more like spa amusement parks than onsens (at least to me). 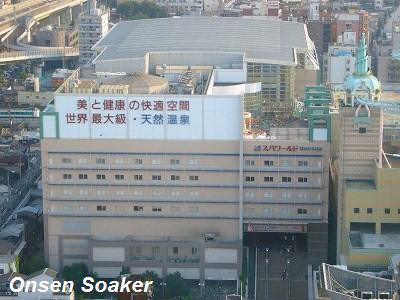 They drilled deeply to get onsen in big cities, for example, 1700 meters for Spa RaQua to add value to their services. Recent engineering development made it possible, but I think they are definitely differnt from traditional onsens. And their admission fee is fairy expensive (Only Spa World often offers deep discount). Personally, I prefer more traditional, simple places like public baths to these commercialized fancy spa places in big cities. Takaragawa Onsen, a ryokan at northern Gunma Pref, Kanto Region is one of my favorites. There are three gender mixed open-air baths scattered both side of Takara-gawa (River Takara), an open-air bath for ladies (see top photo), and indoor baths for men and ladies (gender separated). There are different indoor baths (gender separated) exclusively for overnight staying guests. The survey shows Takaragawa Onsen is popular among people in Spain. Wait for another post on Takaragawa Onsen. Hopefully I'm going to write later this year. After a heavy business week i am back home and i like to read you blog to dream about soaking in a tradional onsen with japanese friends from both gender drinking a cup of sake and discussing about french and japanese life style. If you haven't been to Takaragawa, it's highly recommended. I think you will like it. I resister your blog to my RSS feed and link list of my blog as you see. I'm soryy for not reacting, but actually I'm interestead in onsen (water) itself, not in so-called natural soaking or HADAKA culture. 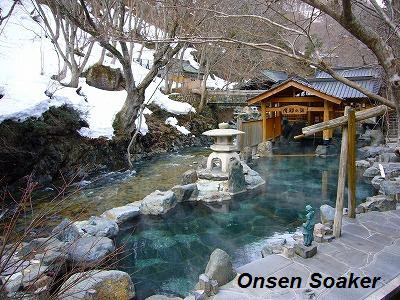 It's so difficult to write about cultural aspect of onsen for me, and I don't intend to do. Don't know what to comment to your blog. Sorry for my bad english ,i have been to Takaragawa,it was the first onsen i visited with my japanese friends.Not too fare from Tokyo i agree with you this one the best place for mixed rotenburo. Sorry for my questions about onsen culture. When i come to live in a new country where local culture is different from mine i like to understand. Usually i try to find friends and ask them to explain the way they live. By the way in find on japanese blogs the meaning of "hadaka no tsukiai"
I've only been to japan twice, my first experiences was at enoshima, which wasn't a true onsen, but very enjoyable, and my second one was at kusatsu, which I quite enjoyed, esecially the very hot water from the Yubatake. But these are all separate gender bath, or mix with you need to wear swim suit. I will be visiting japan in june, and I will either visit kusatsu again or to Takaragawa Onsen, being a mix gender onsen, does the male have to enter the pool naked, and are the water very hot or just warm. I was kind of shy when I first tried out these onsen, now trying a mix gender, I wonder what the experiences will be. what is it like when you tried out a mix gender onsen for your first time.